All the world is struggling to reduce greenhouse gas (GHG) emissions. In general most countries find it quite hard to achieve their emission targets set up by the Kyoto Protocol. The Czech Republic has, however, succeeded in overachieving their goal. The baseline scenario was to reduce GHG emissions in 2012 by 8 %. By extending electricity generation from nuclear, the Czechs managed to cut their emissions by a whopping 32 % compared to 1990. Fig. 1 shows the dramatic decrease. Fig. 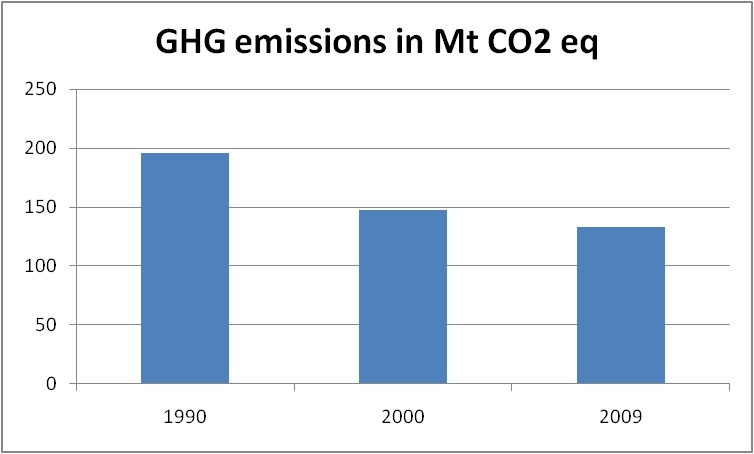 1 Czech GHG emissions in Mt CO2 equivalent. Source: Eurostat. So far the country has produced most of its electricity by burning coal, and this is still the dominant energy source. However, with nuclear on the rise, coal is gradually losing its overwhelming position as can be seen from Fig. 2. Fig. 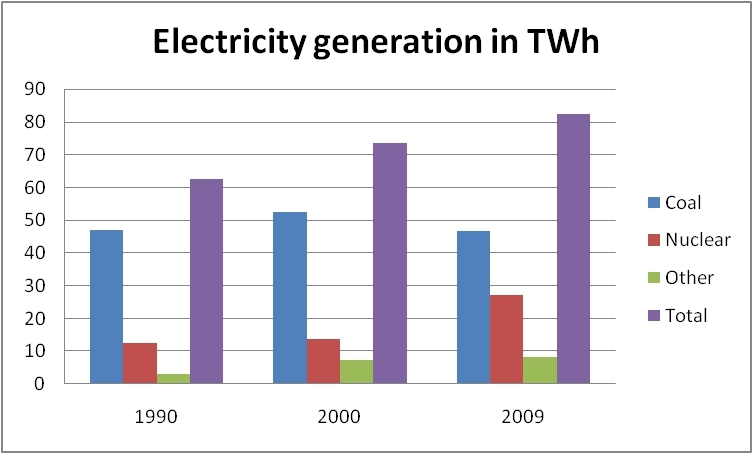 2 Czech electricity production in TWh. Source: Eurostat. Simultaneously nuclear energy is gaining ground. The output from nuclear plants has more than doubled since 1990. Then it accounted for 12.6 TWh. In 2009 the respective figure was 27.2 TWh. Other sources of electricity, in particular gas and renewables, have also increased dramatically during the past two decades. Nevertheless, their share of the whole electricity mix (10.1 %) is still relatively modest compared to coal (56.8 %) and nuclear (33.1 %).